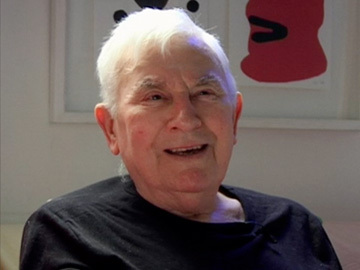 Wellington artist Gordon Crook was known for his bold, colourful prints and tapestries. In this documentary, director Clare O’Leary mixes Crook’s biography (from UK foster care to London Central School of Art lecturer, then decades in Wellington) and interviews with Crook, dealers, students and mates. In this excerpt Crook discusses his work, and collaborating with weaver Lesley Nicholls; and friend Edith Ryan recalls first seeing Crook’s massive Michael Fowler Centre banners. The documentary premiered at the 2010 NZ Film Festival. 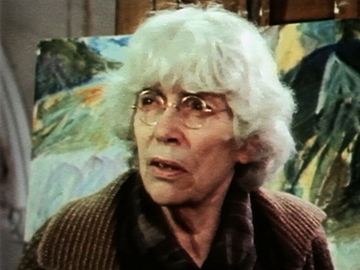 Crook died in August 2011, aged 89. 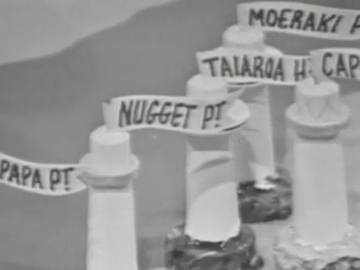 TVNZ’s flagship 80s arts show looks at Sir Toss Woollaston — a pioneer of modern art in New Zealand. Topics include his development as an artist and the “struggle of painting” (contra convention), difficult years trying to support a family, the influence of his wife, and the liberation he felt in his mid-50s when he could finally earn a living from painting. Woollaston is blunt but generous with his time and opinions. There are precious riffs off his famous description of wanting to paint the sunlight in a landscape, “after it had been absorbed by the earth”. 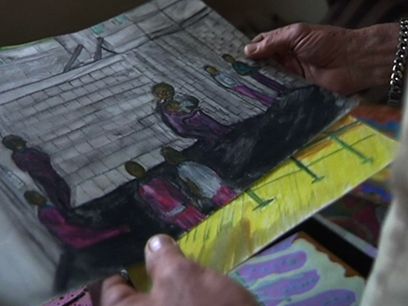 This episode of The Gravy takes an in-depth look at art in prisons. Host Warren Maxwell interviews inmates who have embraced painting or carving while serving time in Mt Eden, Paremoremo and Rimutaka prisons. At Rimutaka, art tutor Paul Bradley points out that art is a vehicle for change both for prisoners and the art audience, and former prisoners talk about how art has changed their lives for the better. Outside the walls, Warren visits at a caged exhibit of musical instruments at Artspace in Auckland and plays a few bars on the flute. In the 1970s, New Zealand artist Allie Eagle identified herself as a lesbian separatist and radical feminist. Her often uncompromising work included pro-abortion painting This Woman Died I Care, which was inspired by a photograph of a woman who died from an illegal abortion. In the 1980s, Eagle became a christian. Made in 2004, Briar March's first, feature-length documentary sees Eagle reflecting on her past with a more moderate outlook — she now has mixed feelings about her earlier stance on abortion. Directed by Owen Hughes, this piece for arts show Artsville explores the feeling of being caught between cultures. Painter Prakash Patel grew up as an Indian in conservative 1970s Wanganui. As a Kiwi he didn’t feel Indian yet he didn’t belong in Wanganui either - ‘What am I doing here?’ In 2006 he was awarded a Creative New Zealand Residency at the Sanskriti Campus in New Delhi. Out of Darkness, Out of India follows Prakash on his journey from discomfort to discovery.